Each year, for one day, locals are permitted to fish in the communal pond not far from our house. 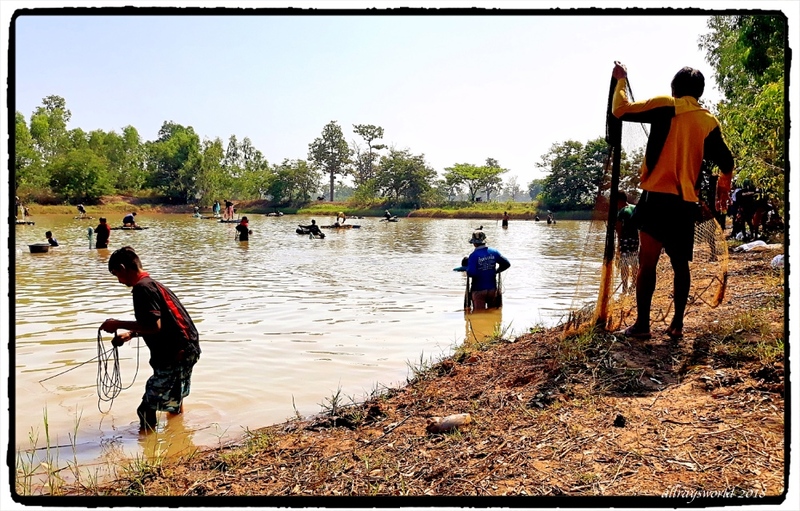 Participants pay 50 baht [about US$1.60] for a licence, and they can keep anything they catch with a hand-cast net. Last year was a bit of a disaster, as the pond seemed to have very few fish. This year, though, it seems everyone is catching enough to make them happy. Who fishes the pond the rest of the year? Ray: The pond is not fished at other times, Elizabeth. Is that a way of controlling the fish stocks in the lake? Did you have a go? Ray: Makes a little bit of community cash for the village, and provides a special day of fun. Un partage interessant entre voisins et amis surement ..tant mieux si la peche a ete meilleure ..
Ray: C'est une bonne journée, socialement, Claudine, et chaque famille du Village aurait apprécié le poisson frais ce soir-là. I suppose one day per year is fine. I assume you don't join in yourself? Ray: I have zero interest in fishing, Chris, so am more than happy to just cycle to the pond and make a few pics. I remember a former photo of this Pond Net fishing - very nices scenes you captured here! Ray: The Village community seems to enjoy the event, Philine, and every house would have had a meal of fresh fish that evening. I am not into fishing, but do enjoy hunting with my camera. I remember you showing this before. To me, the water looks so muddy that thew fish would taste muddy. Our angling season starts tomorrow. Ray: Pond fish always taste muddy, Mary...that is their distinctive taste! Na's family usually leave the fish swimming in clean water in a drum for one or two days before they are brought to the table. What a great idea, good for community spirit, trouble is whoever you go to see that evening there will be fish on the table, if you don't eat fish well, tough luck! Ray: We usually have choice of fish and chicken/pork/egg protein dishes, Brian, so folks like me who don't much enjoy the finding of fish bones in their throat can eat something else. Ray: Folks in the Village eat fish nearly every day, Tom, so Fish Friday is the norm. i like the idea that there is no unfettered fishing, Ray. something to learn from them. Ray: There is a rule for this pond, Ayush. There is zero fishing allowed in the temple pond. All other puddles in public places are without restriction. Ray: There are some 8 year olds in the Village who can competently cast these nets, Peter. I have never tried, but am fairly sure the result would be embarrassing for me. > Interesting idea for a day. Fresh fish supper for the community that night. I remember this from last year. This must be a joy to watch.